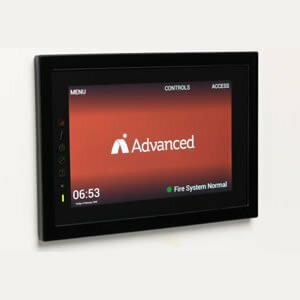 Advanced TouchControl is Advanced’s first fire touchscreen with a different approach to ensure our users get the performance they expect with a 10 inch screen TouchControl is one of the market’s largest touch screens. TouchControl is not stuck in a fire panel, adding cost, complication and compromising on performance. It’s a network node in its own right. TouchControl is a fully functional remote control terminal and repeater, offering full fire panel and network control and reporting. TouchControl’s unique interface allows users to immediately identify zones and devices in fire,fault, disablement, test or normal operation by dynamic colour-coded status buttons. For the first time a fire control panel enhances the architecture and interior of a building. TouchControl is designed to look as good as it performs.